This information is suitable for trainee surgeons and GPs. The anatomy of the middle ear cleft is extremely important in combined approach tympanoplasty. It relies on an accurate knowledge of the relationship between the facial nerve in its vertical portion and the chorda tympani. Indeed it is the bony triangle between them that is drilled in order to open up the channel between the mesotympanum and mastoid regions. It is referred to as the posterior tympanotomy. In all other respects the anatomy of the middle ear cleft is as for any other operation. In this country there is a tendency to use general anaesthetic for the purposes of carrying out this surgery. However local anaesthetic techniques can be used along with patient sedation. A post aural C-shaped hairline incision is made from above the pinna to the level of the mastoid tip. The incision is deepened to the level of the temporalis fascia. The whole skin flap is then elevated anteriorly in this plane to the level of the external auditory canal, but without entering it. A large anteriorly based Palva flap is raised from the mastoid bone to the level of the bony external auditory canal. It should be large enough to expose a finger breadth of bone superiorly to the external auditory canal and cleared inferiorly to the tip of the mastoid and the floor of the external auditory canal. A large temporalis fascia graft is harvested superiorly, but leaving a band of temporalis fascia intact inferiorly to assist with closure. If necessary, conchal cartilage or bone whorls can also be harvested, as can bone dust during the drilling phase of the procedure. An extended mastoidectomy is carried out with identification of the sigmoid sinus posteriorly, the middle fossa dura superiorly. The canal wall is kept intact. The mastoidectomy is extended as far forward as possible into the attic region in order to expose the region of the attic where the incus and malleus are found. The superior and posterior canal wall is thinned, particularly medially. This aids identification of the course of the chorda tympani. Great care is taken during the mastoidectomy to observe and find the main landmarks, which are the lateral semicircular canal and short process of incus. The posterior tympanotomy is created using initially large cutting and then subsequently a large diamond burr, until the facial nerve and chorda tympani have been identified in the vertical course. 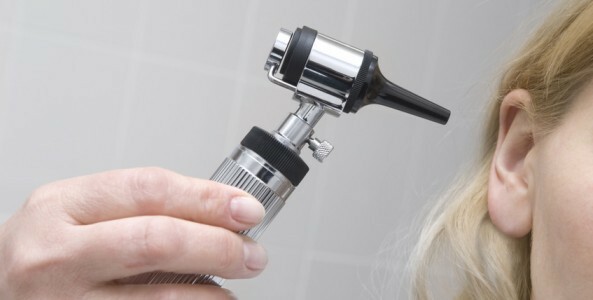 Once identified, progressively smaller diamond burrs are used to open up the triangle between the chorda tympani and facial nerve being careful not to disrupt or unduly move the incus with the drill. The anterior tympanotomy is then performed by raising a tympanomeatal flap. The disease with or without appropriate ossicles, dependent upon the degree of destruction of ossicles, is then removed from the mastoid through to the external auditory canal. It is desirable to remove it as an intact sac. In many cases there will have been loss of the bony wall posterosuperiorly, particularly in the area of the scutum. Once the disease has been removed, hopefully with preservation of the chorda tympani if it is not completely involved in the disease, an endoscopic inspection of the cavity with particular reference to the attic and posterior tympanotomy is made. This is followed by an endoscopic examination via the anterior tympanotomy of the retrotympanum, the stapes footplate region, the protympanum and hypotympanum. A record is kept on whether the disease has been totally cleared (grade I), appears totally cleared but with a degree of uncertainty in the surgeons mind (grade II) or there is known residual disease (grade III). In general this latter cadre will be due to disease between the stapes crura, in the retrotympanum or attic, but deemed impossible to remove at the time of the first look surgery. At second look surgery it is often easier to remove it as a pearl of disease. Reconstruction of the bony canal wall is undertaken either using a bone whorl, temporalis fascia bone dust envelope or cartilage. Repair of the ossicles is not normally undertaken at the first look procedure unless the disease has been extremely limited, however opinion does vary on this and some surgeons believe in initial reconstruction. The residual tympanic membrane is then repaired with an underlay temporalis fascia graft in the normal way. The middle ear cleft is packed with gel foam to support the graft and the external auditory canal is then packed with gel foam to support the graft laterally. Routine closure of the Palva flap with a continuous Vicryl suture is carried out and the skin incision closed usually with skin glue. The ear canal is packed with pieces of BIPP. In experienced hands this will vary between one and a quarter hours and one and a half hours, though in difficult cases it may be more prolonged. In training cases it would be reasonable to allow two and a half to three and a half hours. Home the same day or overnight. The head bandage is removed after 48 hours, though the patient may still go home the same day. Risks include total hearing loss, dizziness, noises, facial paralysis, loss of taste of the tongue, secondary infection and recurrence of disease. There is also the need for a second look procedure with or without conversion to a cavity if necessary. 95% of patients will require a second look procedure either to check for the presence of residual and/or recurrent cholesteatoma and also for the reconstruction of the ossicular chain. The prognosis however at second look is extremely good. It would be reasonable to expect a residual cholesteatoma rate of between 5%-15% at second look surgery. Recurrence may arise in about 10%-15% of patients. Alternative treatments include atticotomy, attico antrostomy, small cavity mastoidectomy, modified radical mastoidectomy, radical mastoidectomy and extended modified radical mastoidectomy.